1Faculdade de Medicina de Campos, Hospital Escola Álvaro Alvim, Campos dos Goytacazes, Rio de Janeiro, Brazil. 2Instituto Federal de Educação, Ciência e Tecnologia Fluminense, Campos dos Goytacazes, Rio de Janeiro, Brazil. Received: March 14, 2018; Revised: April 15, 2018; Accepted: May 10, 2018; Published online: December 17, 2018. A 42-year-old man presented with low fever, excessive sweating, weight loss, and splenomegaly. His total leukocyte count, hemoglobin level, and platelet count were 2.1×103/L, 10.8 g/dL, and 92×109/L, respectively. Serum protein electrophoresis demonstrated a monoclonal spike and immunofixation confirmed an IgG-κ monoclonal protein. 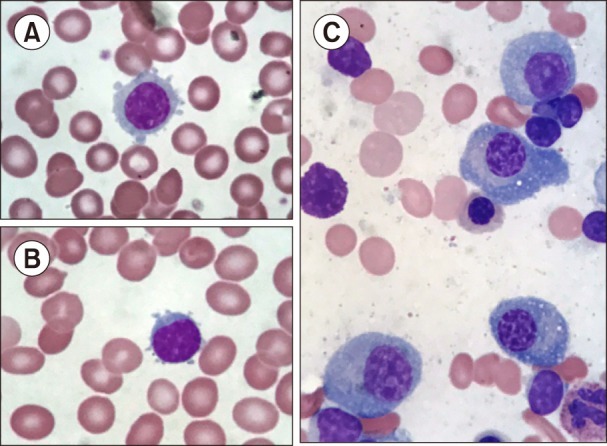 Peripheral blood smear revealed 11% small to medium-sized lymphocytes with oval nuclei, mature chromatin, inconspicuous nucleoli, and circumferential cytoplasmatic short villous projections (A, B; Wright-Giemsa stain, ×1,000). Peripheral blood flow cytometric immunophenotyping revealed a clonal B-cell population expressing cluster of differentiation (CD) 19+++, CD20+++, CD22+++, CD79b++, CD38+, FMC7++, and CD11c++ with κ light chain. A bone marrow (BM) aspirate smear showed increased plasma cell count (16%) with focal clustering, moderately large and ovoid shape, round and eccentrically placed nuclei, and strong basophilic cytoplasm with a broad perinuclear clear zone without any villous projections (C; Wright-Giemsa stain, ×1,000). No villous lymphocytes were detected. BM flow cytometric immunophenotyping revealed two clonal populations with restricted κ light chain expression: a clonal B-cell population phenotypically similar to peripheral blood, and a clonal plasma cell population that expressed CD19+++, CD38+++, CD138weak, CD45weak, CD56−, and CD117−. BM biopsy showed nodular interstitial lymphoid involvement and scattered plasma cells. Splenic marginal zone lymphoma with plasmacytic differentiation and villous lymphocytes was diagnosed. Plasmacytic differentiation may occur in almost all low-grade B-cell lymphoproliferative disorders, varying from being rare (mantle cell lymphomas) to being uniformly present (lymphoplasmacytic lymphoma). Distinguishing between myeloma and lymphomas with marked plasmacytic differentiation may be challenging.